KW Variant 1 Coil-over System for MINI R56 Cooper, Cooper S, R55 Clubman, R57 Cabrio, R58 Coupe R59 Roadster. 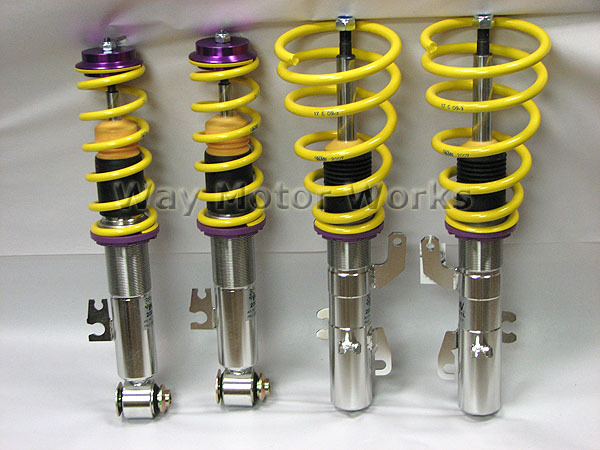 This system uses the OEM front upper spring perch and also mates up perfectly with OEM or aftermarket camber plates. Like all KW coil-over systems the strut bodies are all stainless steel with stunning eye appeal. The KW V1 coil-over system has ride height adjustment only with fixed dampening for those MINI enthusiasts who want to lower their ride and increase handling performance at a reasonable price.